Background: Angiogenesis involves the process of sprouting of microvessels from preexisting microvasculature and is held responsible for the growth, malignancy and metastasis of cancer. Heat shock protein Hsp90 has been proven responsible for indirectly inducing multiple pathways leading to angiogenesis and metastasis in cancer. Recent researches shift towards proposing novel phytochemicals as possible antiangiogenic agents. 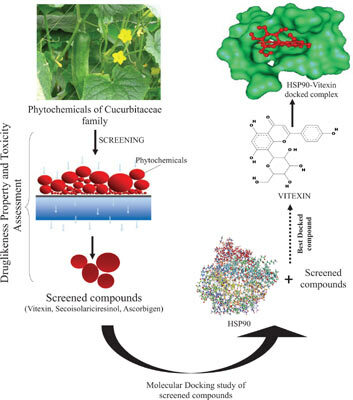 Objective: The study aims towards Virtual screening of compounds from Cucurbitaceae family and their Druglikeliness and PreADMET filtering in search of potent lead as Vitexin, targeting Hsp90 and hence restraining angiogenesis. Materials and Methods: Structures of phytochemicals from Cucurbitaceae family were retrieved from PubChem database and were converted into suitable 3-D structures. The target protein, Hsp90 was retrieved from RCSB Protein Data Bank. Phytochemicals of Cucurbitaceae family were filtered through enumerated Lipinski’s rule of five and ADMET toxicity profiling and the filtered compounds were further taken forward for molecular docking analysis and interaction studies using AutoDock Tools 4.0. Results: The docking results revealed Vitexin, a prominent glycosylated natural flavonoid, showing promising inhibitory potential against Hsp90 with binding energy of -8.80 kcal/mole and Ki 353.24 nM as compared to its known inhibitor Ganetespib having binding energy of -7.33 kcal/mole and Ki 4260 nM. Vitexin also exhibits better drug having properties with satisfactory ADMET profiling in relation to Ganetespib. Conclusion: The result proposes Vitexin to hold prominent antiangiogenic potential surpassing different in silico parameters and thus expected to be a multi-targeted novel antiangiogenic lead. Angiogenesis, molecular docking, phytochemicals, vitexin, ganetespib, Hsp90.